Plywood can be difficult to join together, especially when you are looking to make an invisible joint, where no hardware is exposed. The cut edges combine end grain with the side grain in the wood, leaving little space for a good glue joint. This usually means that hardware needs to be used, or the plywood needs to be attached to brackets on the inside. 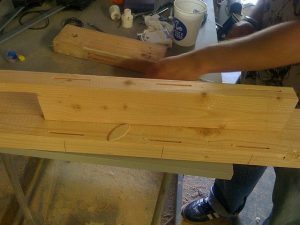 The typical method of attaching pieces of a plywood cabinet casing together at the corners is with nails or screws, leaving a finishing mess. If the plywood doesn’t split, you’ve left with hardware or holes from the hardware exposed and needing filling. While acceptable for rough work, this sort of joint is not acceptable for cabinetry or furniture. However, with a biscuit joiner, clean, unobtrusive joints can be made in plywood, with no visible hardware and clean edges coming together. Whether joined together at 0 degrees, 45 degrees or 90 degrees, all joints are clean and tight, as well as being strong. It’s almost as if the biscuit joiner was invented specifically for use in joining plywood together. A biscuit joiner uses a small compressed wood disk as the joining medium. The tool cuts slots precisely in both pieces, which this disk is glued into. Because of the cut, the biscuit is totally hidden. It also provides a solid surface for gluing, which gives side grain to side grain, the best possible combination for glue adhesion. The key to successful biscuit joinery is the accuracy of the cuts. The tool is designed to provide this accuracy, but it is important that it is properly set up and used. Even the slightest error in tool adjustment or alignment will cause a poor joint. 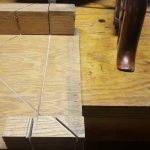 While biscuit joiners usually have gauges built into them, your best setup comes from using the wood you are going to join as a gauge for setting the fence position. That way, there is no error from miscalculation or misreading the gauge. To adjust the fence on the biscuit joiner, set one of the pieces you are going to join flat on the workbench. The bench must be clean and clear of sawdust and chips. Check that the workpiece is laying flat and then set the biscuit joiner’s fence to 90 degrees. Place it on the workbench so that the fence overlaps the edge of the workpiece. Once in place, the adjustment knob can be used to set the fence’s position. The fence adjustment is usually a small knob. This is intentional, so that you don’t have much leverage. You want to raise the fence enough that it is not in contact with the workpiece; then lower the fence until it makes good contact. You will be able to tell when that it, as the knob will immediately become very hard to turn. Stop and tighten the locking screws. The only other adjustment on the biscuit joiner is for the size of biscuit used. These range in size from 0 to 20, in increments of 5. In most cases, you’re best off using the largest size biscuit that will work with your project. Setting the size of the biscuit on the tool adjusts the depth of cut for the blade. This adjustment ensures that it cuts half the biscuit’s width into each piece. With the biscuit joiner properly set and the workpiece on the bench, the bench top acts in conjunction with the fence, to ensure correct alignment. Before cutting, mark both boards to be cut, so that you can place the cuts opposite each other. A slight offset isn’t a problem, as the slots the biscuit joiner will create are slightly longer than necessary, allowing you some longitudinal adjustment of the workpieces. With both pieces cut, glue is applied, the biscuit inserted and the workpieces clamped together to dry.